It is a beautiful early Spring morning the parrots are busy in the vibrant red bottle brush, the sweet pea are in flower the glorious Spring breeze abounds with a slight scent of Summer. I am a morning person and love to hear and see the world wake, its a good life. 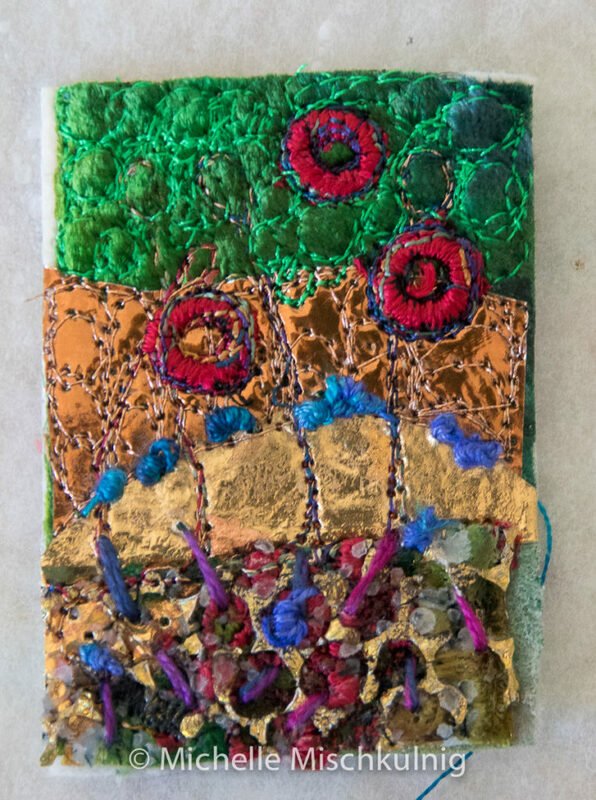 I am inspired by places I have been, the colours, the textures, the emotion, places I wish to visit needing to feel their rhythm, drawn to their conversation, enthralled by their colour an texture. It is the everyday that holds the beauty and inspiration, watching the seasons change, listening and laughing with friends and family, the roar of the ocean. I hope to convey the colour and movement, how I respond emotionally. 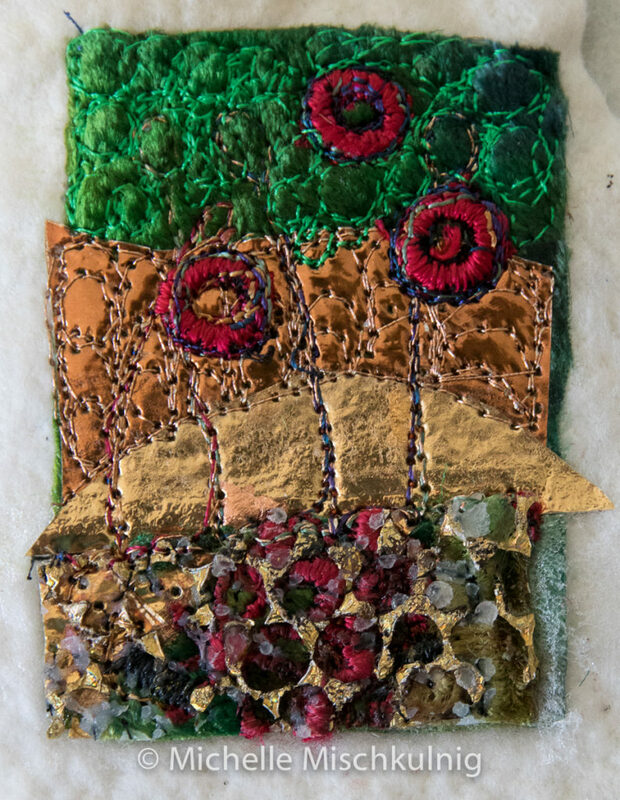 My textile artwork is not an accurate or literal depiction it is how I feel it in my heart, how I am moved what makes me smile .All my textile artwork come from my heart, head and hand. 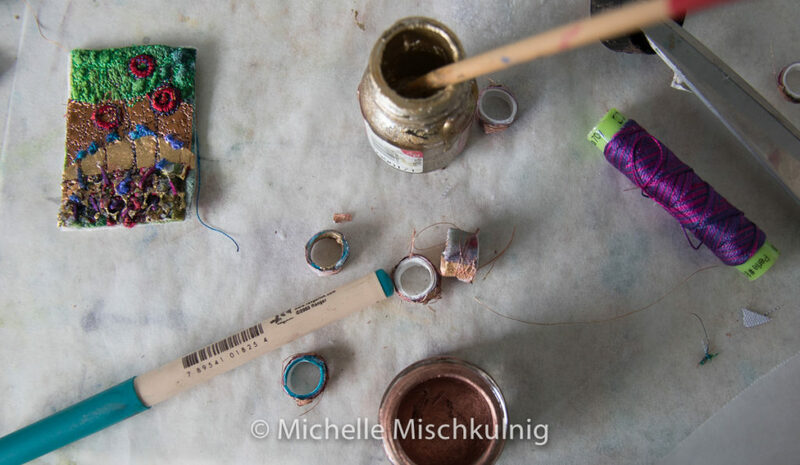 When I am creating I love to use hand dyed fibres and silks , found objects and collected treasures. 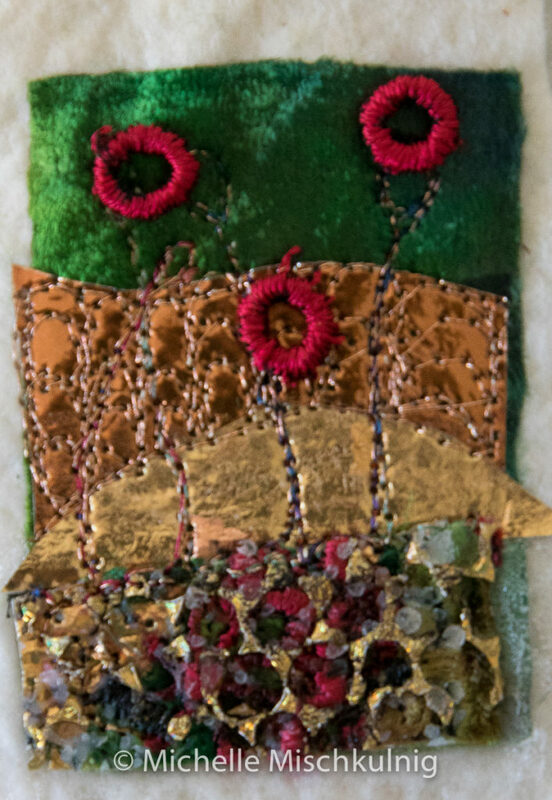 I layer, tear, fold, stitch, paint, allowing my sewing machine to dance across the surface and pull all the elements together. 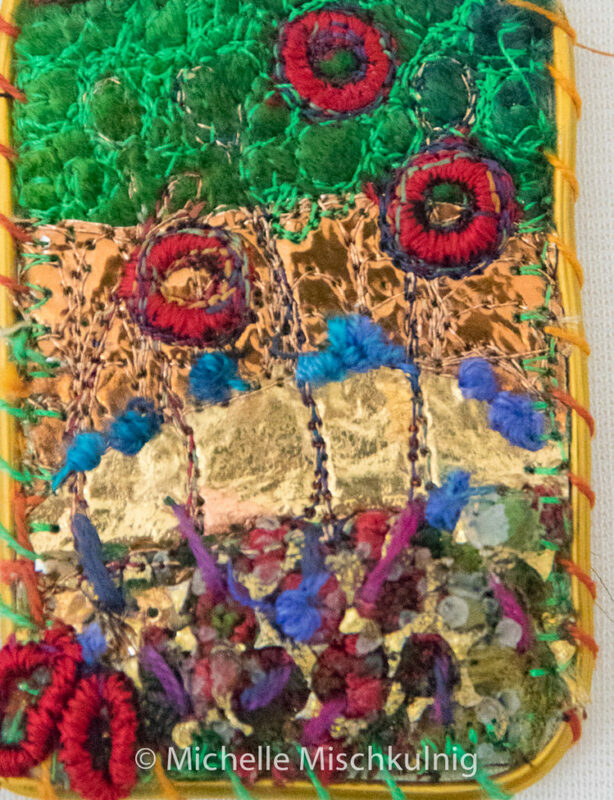 As a teacher my goal is to inspire my students to make them passionate with the use of colour and texture. 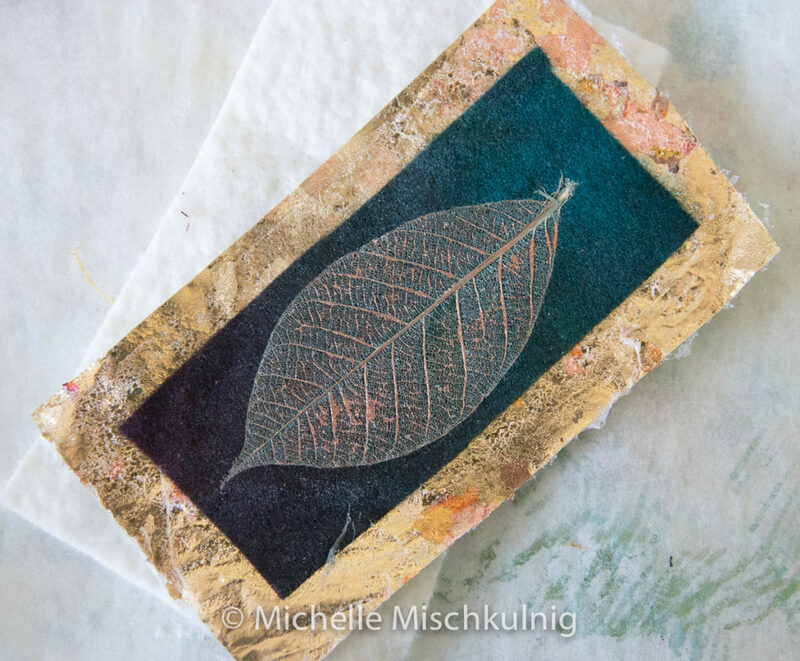 I hope to introduce my students to new materials and techniques and watch them grasp these possibilities and make them theirs. I I want them to hold this possibility tight in their hands head and heart allow it to grow. Now for the project idea I want to share . Bibs and bobs of interesting fabrics papers and castaway projects. Include a variety of tetxures. 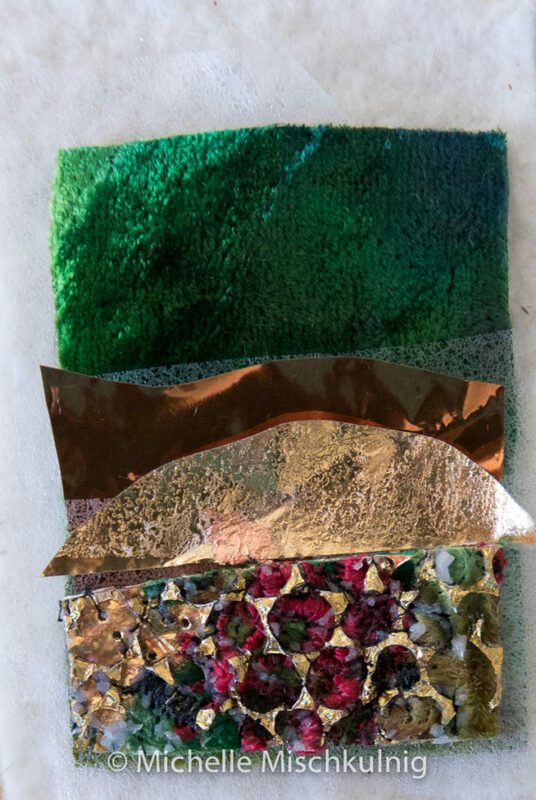 I have used hand dyed silk velvet, lace, copper and silver foil papers, you can substitute with what you have. Rayon machine embroidery threads or your choice. 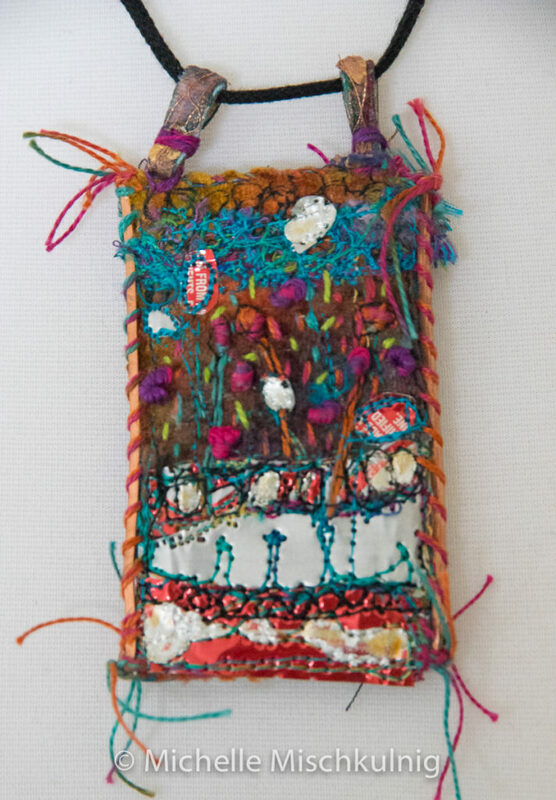 hand stitch threads and needles. To stiffen and hold firm I used a sticky sided lampshade fabric ( the stiffener used to make lampshades )I find it is great for these projects you might like to try other stiffeners or even a piece of plastic from a ice cream container etc. I like them to be rigid so as they don’t bend or loose their shape when worn. Backing fabric such as black calico. Wire for edge https://inspirewithwire.com.au/shop/ I think I bought 14 gauge. it needs to be reasonably thick to hold the edges stiffly. Some of my materials laid out and ready to piece. 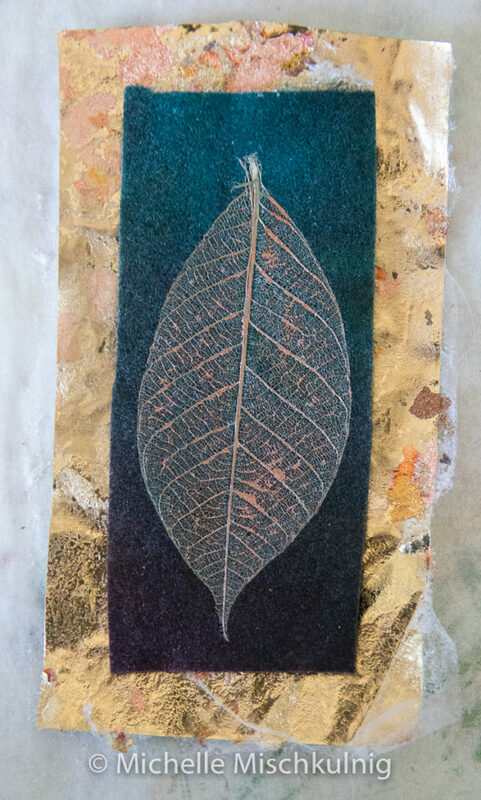 I have cut a piece of velvet to the size I would like entire pendant to be, 5cm x 7cm. 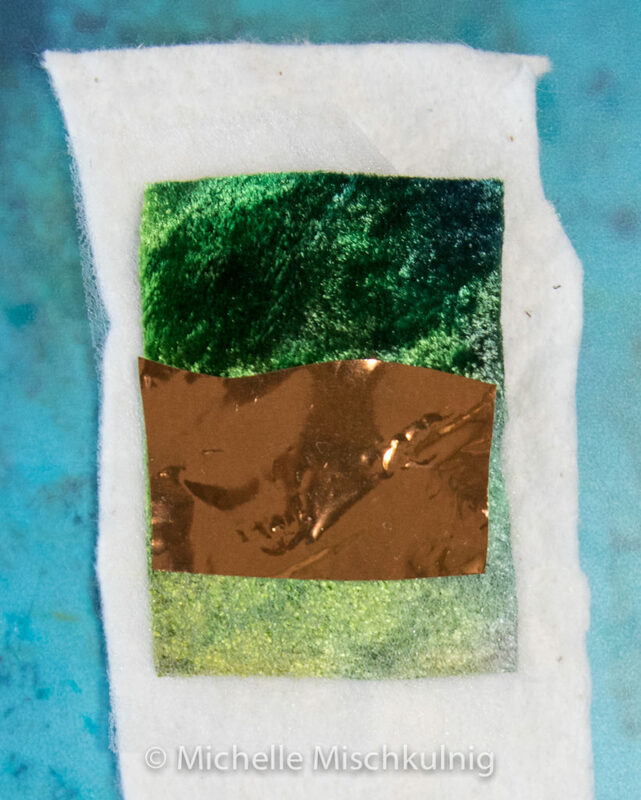 On top of the velvet I place a small peeled layer of fusible web where I am going to place my surface layer of copper foil paper. 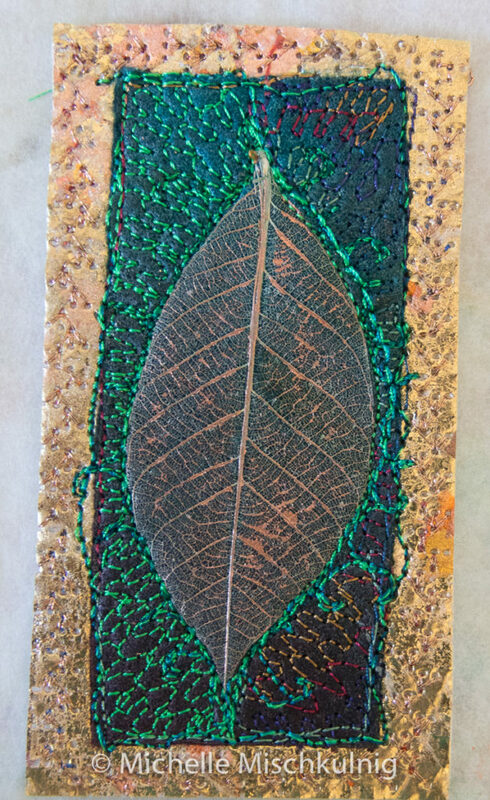 On top of the copper foil paper I place another small piece of fusible web where I would like another 2 textures to sit. 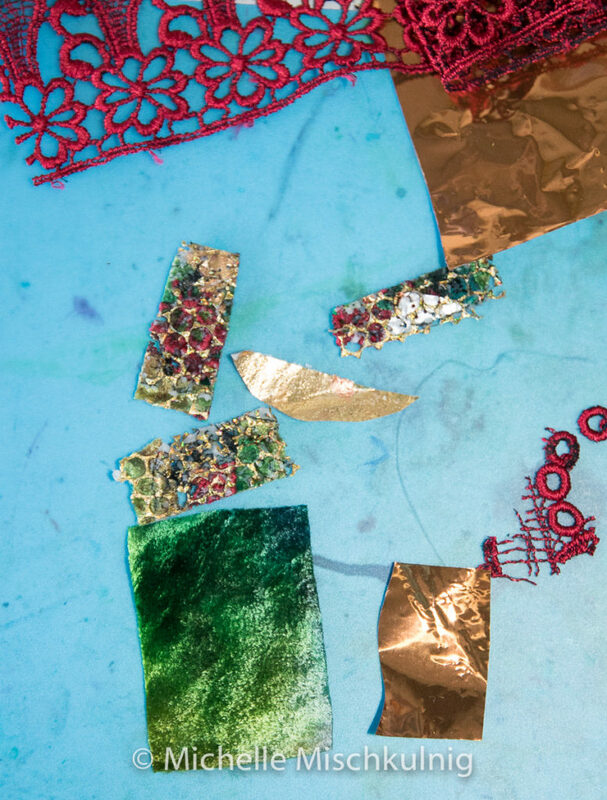 All these layers are then fused together with a hot dry iron using baking paper to protect iron and layered surface. Ready your machine for free motion embroidery according to your manual and use a closed toe foot.Place the fused layers on top of a pre cut piece of batting and free motion embroider. I have cut small red circles from the lace which I then free motion stitch onto the surface of the pendant. 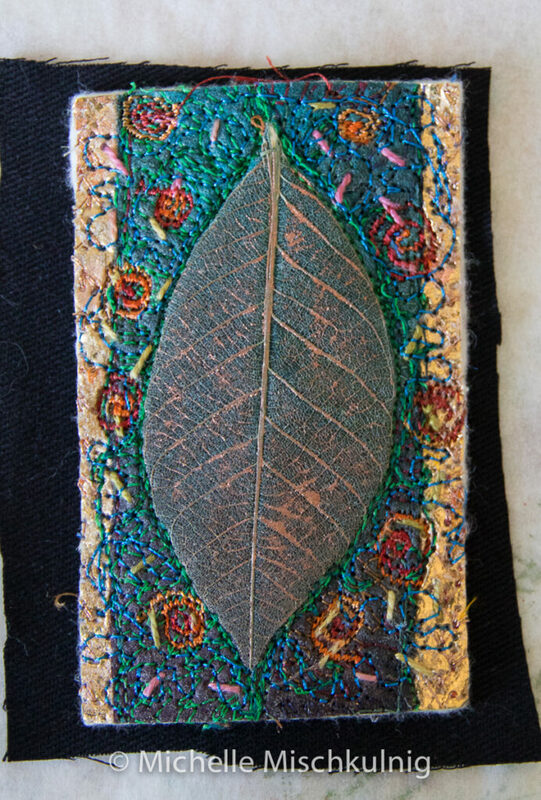 A little hand stitching to add texture and colour. Cut 3 pieces of your stiffener I have used sticky sided lampshade stiffener. These cut pieces should be a little smaller then the finished size of the finished pendant front. Stick one piece of peeled stiffener to the back of the brooch front and then peel the second piece and stick to the back of the first piece. This makes it nice and firm. 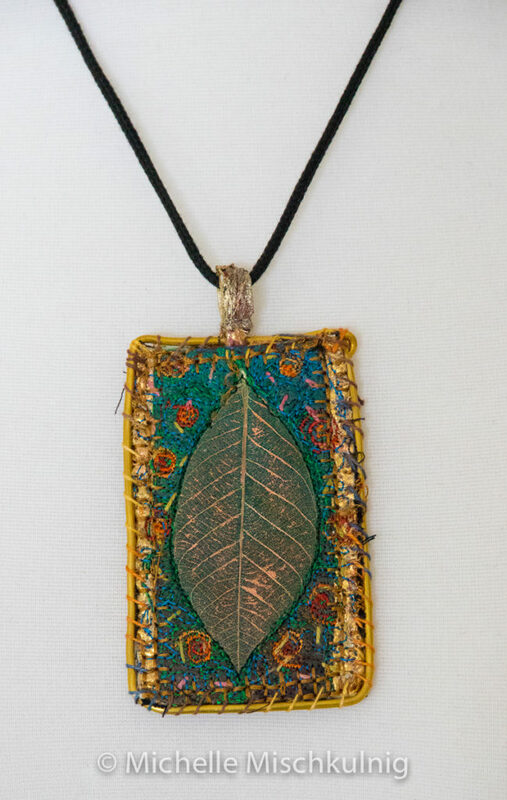 Take you backing fabric and cut to same size as the embroidered pendant front. 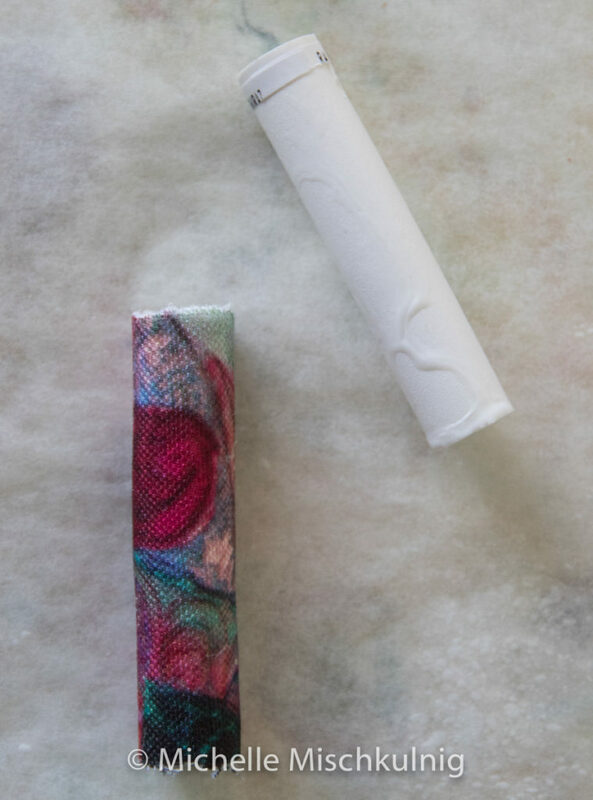 Peel your 3rd piece of precut stiffener and attach to the back surface of the backing fabric then use craft glue to attach to the front and back of the brooch trim to size. Making the loops for the pendent ( jump rigs ) for the neck chord. yes ! 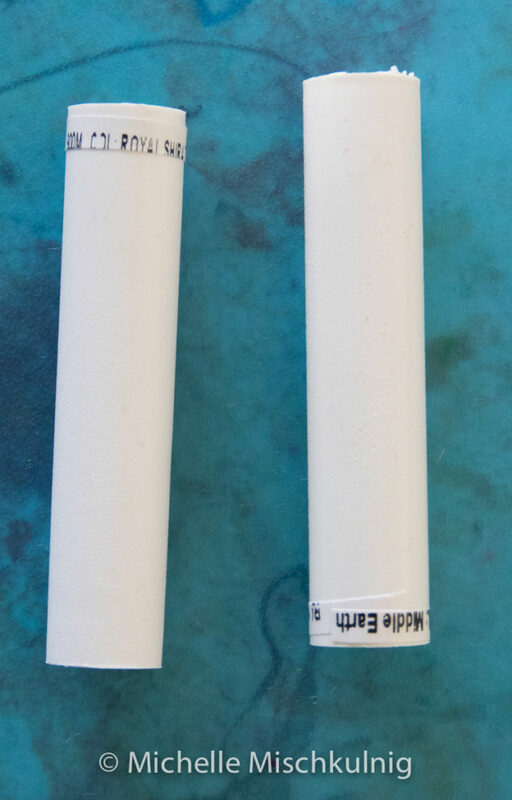 a use for those empty cotton reels.These are the reels your machine thread comes on not all thread comes on these tubes and if yours don’t you can buy a metal ring or make your own out of cardboard. 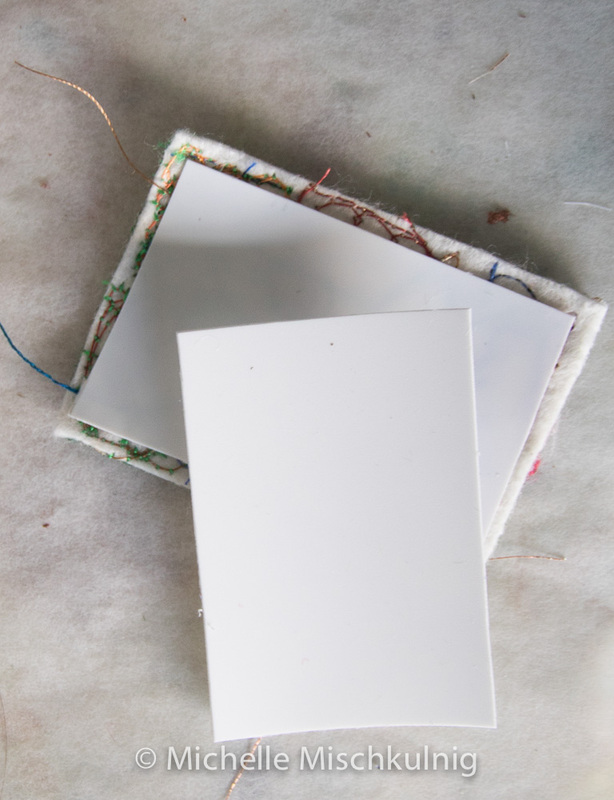 Cover the surface of your cotton reel in a craft glue and wrap fabric around it.When dry coat the fabric cotton reel in Pva glue and wrap threads and papers in various thickness. When that is all dry optional step is to rub with some gold wax buff and then cut into narrow rings. 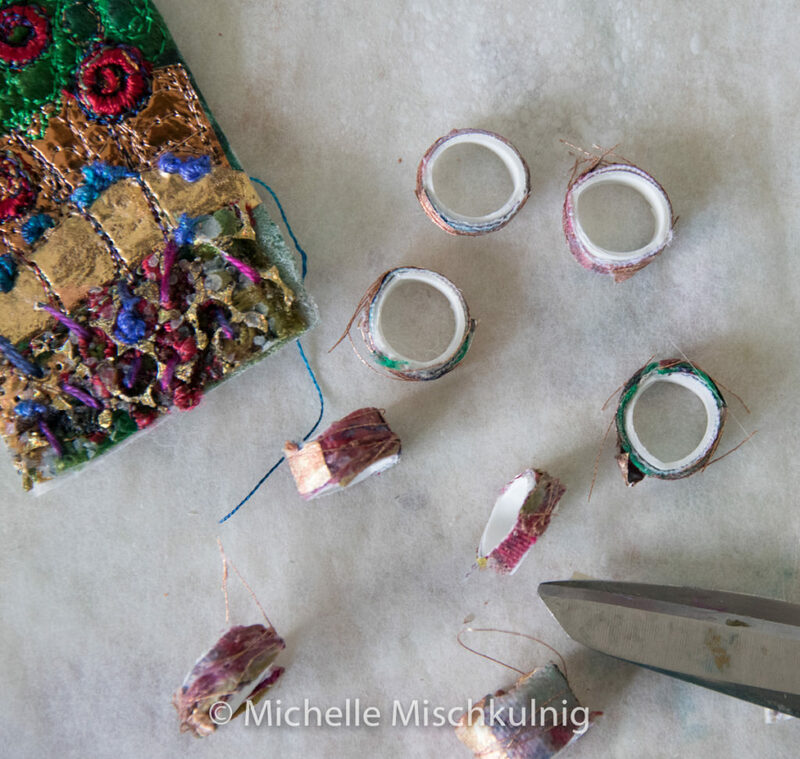 Paint the inside of the rings and the edges using permanent felt tip pens or paint. 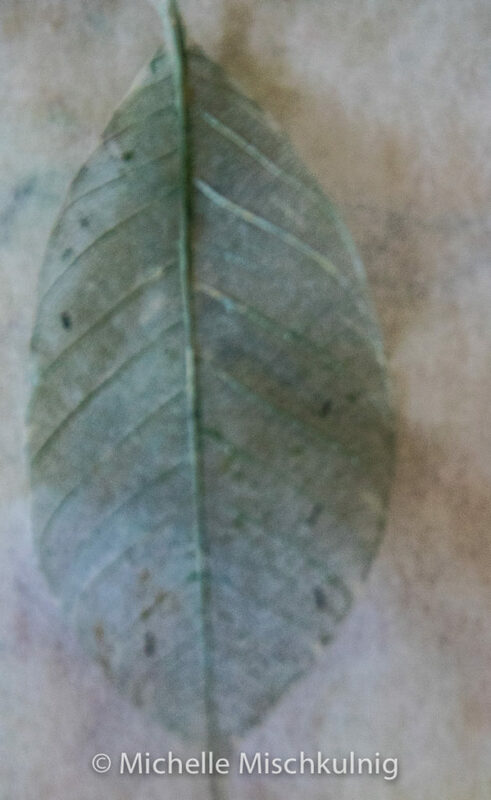 Leave to dry. Attaching the wire edge and loops. I have used some wire that I bought from https://inspirewithwire.com.au/shop/ I think it gauge was 16 0r 14. 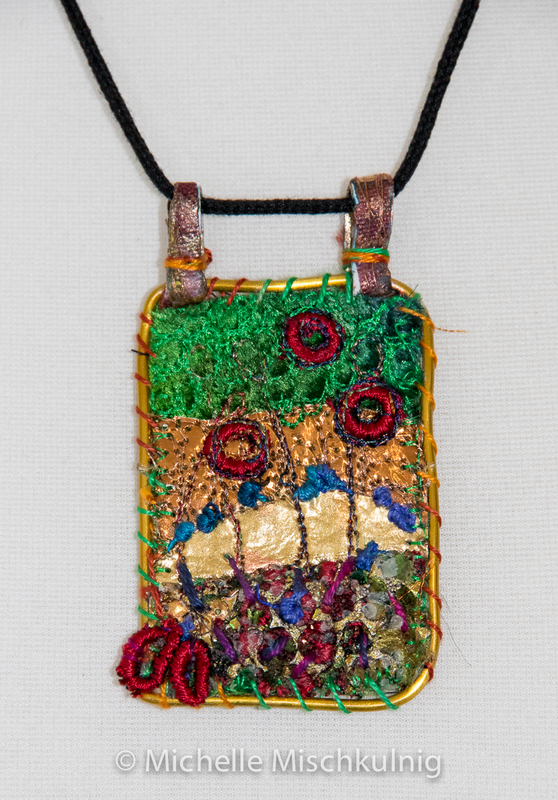 Starting at the bottom left hand corner I have hand stitched around the outside edge of the pendant. On the top edge I have hand stitched the loops to the fabric and then threaded the wire through the loops and hand stitched the wire through the loops and across the top of pendant. 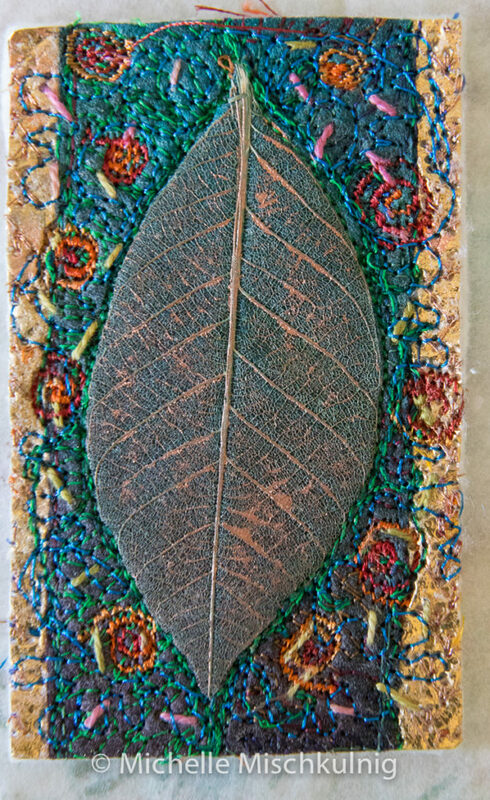 Using a skelton leaf I have coloured it with permanent metallic felt tips pens and buffed over with a copper wax rub. 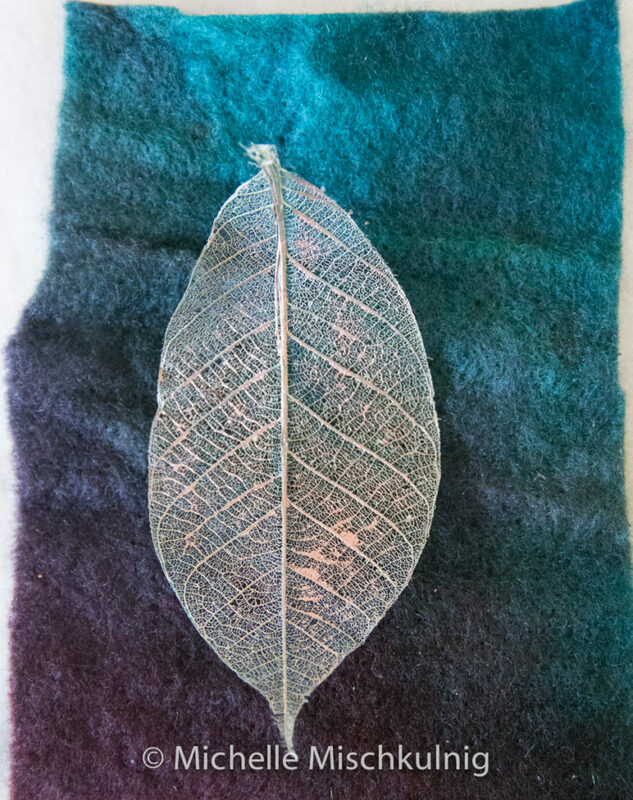 I have chosen some hand dyed felt as my backing for the leaf. 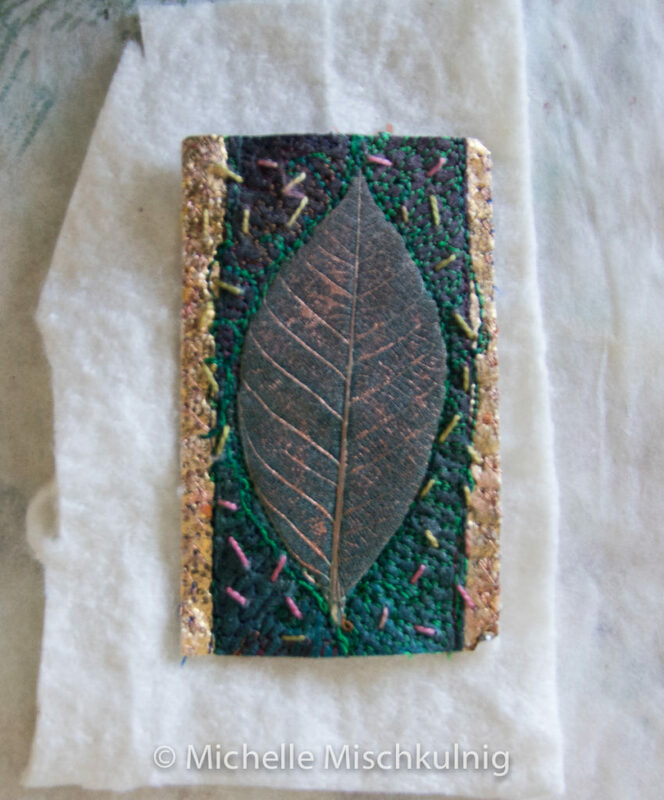 Place a peeled layer of fusible webthe size of your pedant front 6cm x 9 cm over the felt and put your leaf centrally on the top, fuse these together with a hot dry iron and baking paper protecting the iron and surface. 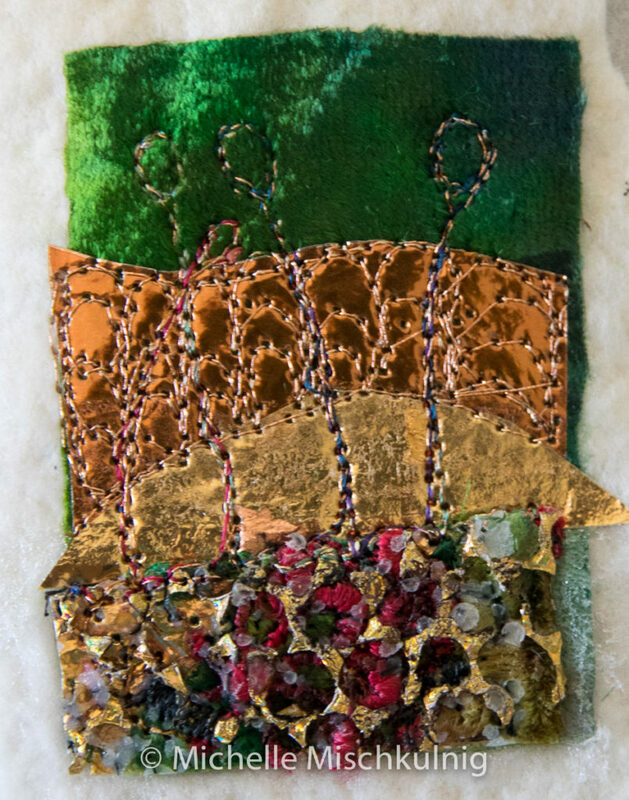 I am backing the felt with some gold foil paper backed on to cotton batting. Trim to size required and add some hand stitching to for interest. Completing with a final layer of free motion stitching. 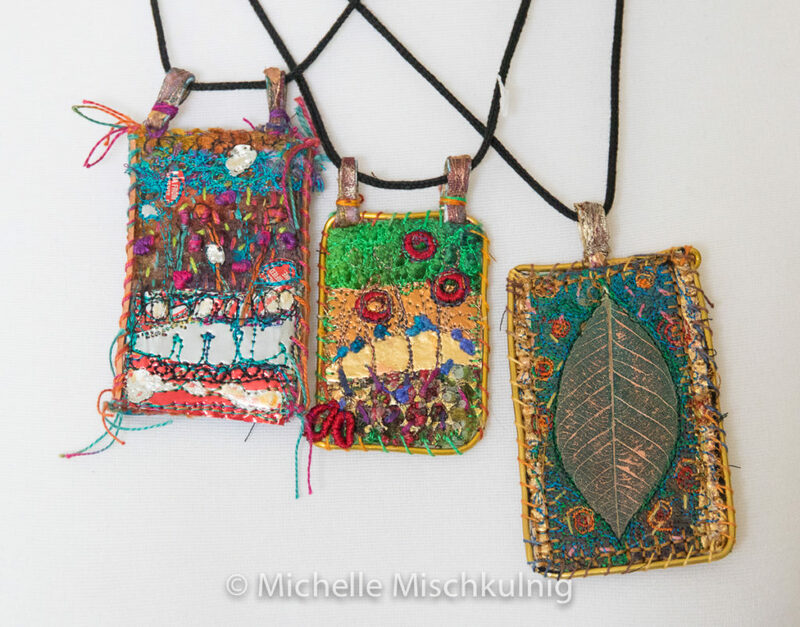 To finish see above instructions on stiffener backing, * finishing fabric pendant edges and wire edging. On this one I only used one loop as seen below.